What is it with me and Czech absurdity? I loved the nasty humor in Ludvík Vaculík’s The Guinea Pigs (previous post) and Patrick Ouředník’s Case Closed (previous post), and now here I am with Franz Kafka’s The Metamorphosis (Die Verwandlung), which I first read, in Stanley Corngold’s translation, in high school. Warning: this post contains spoilers. Rereading The Metamorphosis makes me wonder about my teenage fascination with the book. Namely: Did I fear waking up and thinking, like Gregor Samsa, the story’s protagonist, that I’m a giant beetle? And that I will dry up and drop dead, lonely, alienated, and shut away in my room? Or did I identify with Gregor’s younger sister, Grete, a not-so-skilled violin player who grows weary of the burden of having a coleopteran brother? 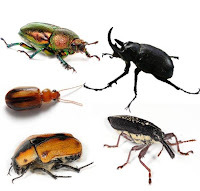 Another option: I felt guilty about my enjoyment of collecting insects in sixth grade, feeling remorse after a June bug that revived itself in my hand when I attempted to take it out of the kill jar. But how could a three-foot beetle like Gregor just walk or even fly away, particularly after being injured by his own father? The human—or coleopteran—condition is absurd indeed. The only solution Gregor sees is to disappear. Which he does, shortly after three in the morning, after a “state of empty and peaceful reflection” that doesn’t resemble his unsettling dreams in the beginning of the book. Thus ends Gregor’s life and Gregor’s metamorphosis. I don’t remember finding the ending of The Metamorphosis so sad in past readings but Gregor seemed, to borrow again from Nabokov, especially “tragically absurd” this time. I suspect this was partly due to the effect of the contrast with a more comical brand of absurdity… including the afore-mentioned Case Closed and Guinea Pigs. I followed The Metamorphosis with something more comically absurd: The Meowmorphosis, a Quirk Classic authored by Franz Kafka and Coleridge Cook. In this version of Kafka’s tale, Gregor awakens to find that he “had been changed into an adorable kitten.” This Gregor wants to knead the coverlet… and wonders how he “should reorganize his life from scratch.” Much of The Meowmorphosis replicates The Metamorphosis, albeit with changes that transform Gregor yet again—from insect to feline and from ugly to cute—but Cook inserts a long passage in the middle of the book, in which Gregor leaves his room for the streets and meets some other cats who have undergone metamorphoses of their own. I won’t reveal too much but will say that Gregor is put on trial by a cat known as Josef K., which brought me back to reading Kafka’s The Trial (Der Process) in college. Cook also includes mentions of “writer issues” that segue into a humorous but very topical discussion of cats and dogs that begins with this: “Psychiatry is a dog’s profession, not a cat’s—a cat thinks what he thinks and that is all.” A bit later the cat says, “What we desire, we perform, and that is what is meant by freedom.” He goes on to admit that “cats know they are monsters and have no particular qualms about it…” Of course poor Gregor, whom the other cats have vilified for obeying his family, has to return home to close the story properly. “They are family and must endure me,” he tells himself, thinking they will take care of him. If only! The Meowmorphosis was a fun way to cool down a bit after Gogol and Kafka; though Gregor faces the same sad end in both books, I certainly appreciated the comical absurdity and irony of Gregor turning into a cute and fuzzy (albeit rather large) animal instead of an ugly bug. Though you could read The Meowmorphosis without having read Kafka, I think Meow- probably has maximum enjoyment potential for those who’ve read Meta-. Disclosures: I received a review copy of The Meowmorphosis from Quirk Books, from Eric Smith, whom I enjoyed meeting at BookExpo America in 2011. Thank you! Eric (who’s a friend on Facebook) also sent me a Meowmorphosis poster that I hung in the bathroom, much to the surprise of at least one dinner guest. Also: I met and chatted with the writer known as Coleridge Cook at a literary event. Image credit: Coleopteran collage from Bugboy52.40, via Wikipedia.